These cute and practical (and free!) 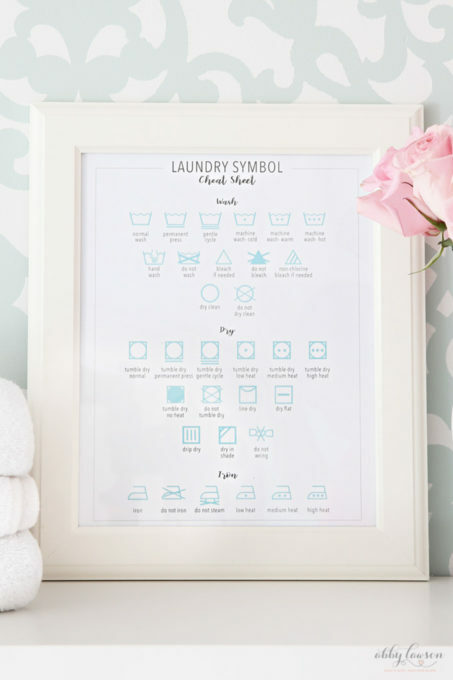 laundry cheat sheet printables will help you decode all of those hard-to-remember laundry symbols and treat those pesky stains– perfect for spring cleaning! 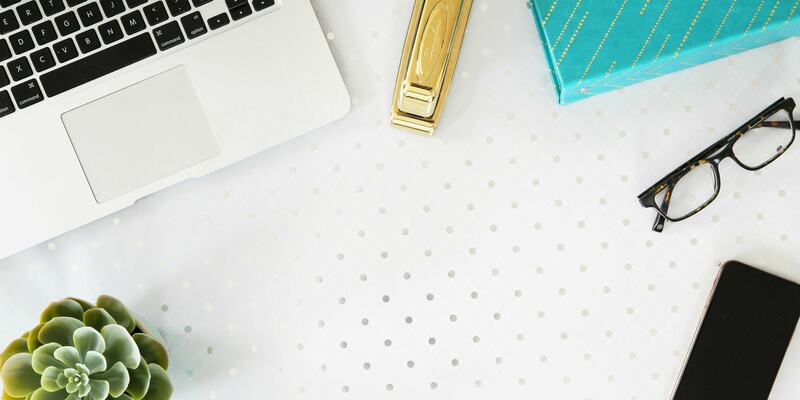 I am so delighted to be joining with some of my bloggy besties today to bring you a bunch of beautiful spring printables! A huge thanks to my friend Krista at The Happy Housie for hosting! 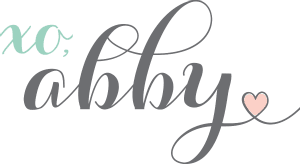 If you’re popping over from Ashley’s place at Cherished Bliss, welcome! Wasn’t her lemon printable the cutest?! In fact, I actually made these printables during the time I should have probably been cleaning instead because making printables about cleaning is a whole lot more fun than actually cleaning, right?! 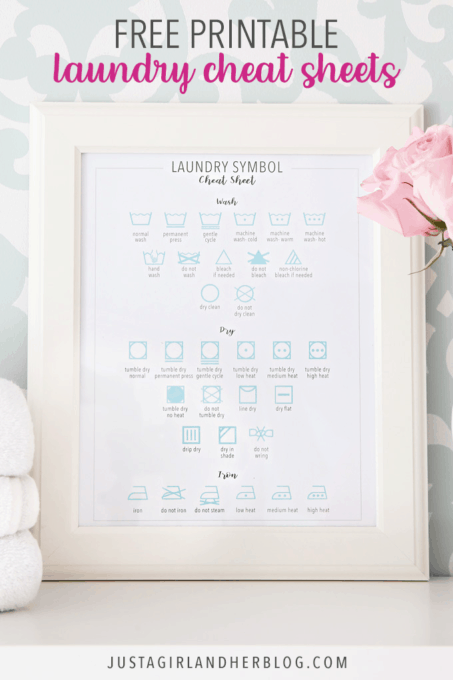 Click here to download the laundry symbol cheat sheet! I guess if I’m going to clean, though, laundry would be my chore of choice because 1. The machines do most of the work, and 2. I can catch up on my shows while I fold. So there’s that. 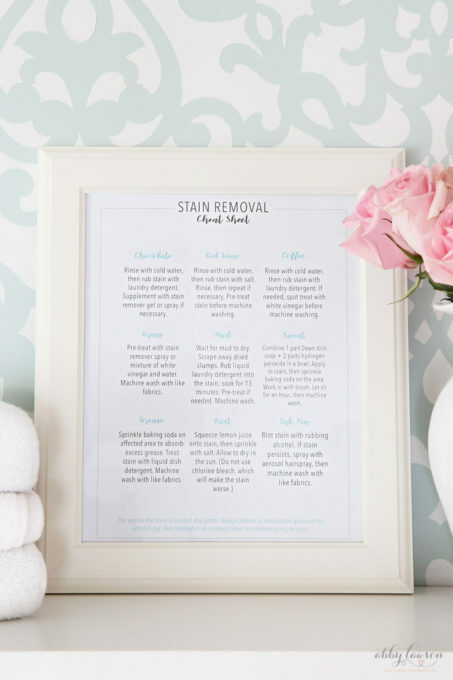 Click here to download the stain removal cheat sheet! The other good news about these laundry printables is that along with being incredibly practical, they are also oh-so-cute, so you can hang them up in your laundry room, and when guests come over, you will not only impress them with your vast laundry knowledge, but they will for sure “oooh” and “ahhh” over your beautifully accessorized laundry room as well. And if that’s not a win-win, I don’t know what is. 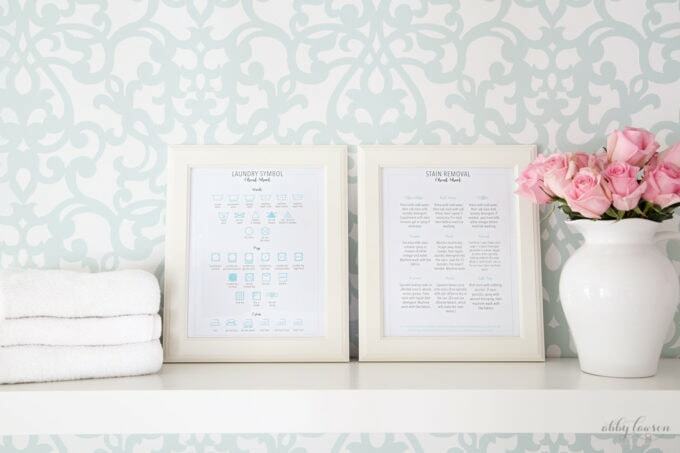 Looking for more printables to help whip your house into shape? These can help! Once you’ve snagged your pretty laundry printables, don’t forget to pop around and visit the other bloggers who are sharing their gorgeous spring printables today as well! My sweet friend Summer Adams is up next! Thanks so much for stopping by today! Happy almost-spring! These are so cute and practical, Abby!! I’ll have to print them for our laundry room! Enjoy your day, friend! Love it, Abby! I have a laundry symbol printable to share soon too! I need all the laundry help I can get, my friend! Bring it on! 🙂 Hope you’re having a great week! These are great. Personally, I do not like winter at all. Living in Michigan, it seems endless. Right when we think it’s changing, we get snow again. Looking at all of these made me very excited for the warmer weather to come so I can get some spring cleaning started. It always is so refreshing. Thanks for sharing. I’m with you, Audrey! We need to move south! 🙂 Here’s to hoping that spring is right around the corner for us both! What a cute and funny post! And on top of that, its’ so practical. Last week when I was doing laundry, I had to strain to try to decipher the symbols on a shirt, and then thought, “Even if I could make them out, I still don’t know what they stand for.” Sheesh! Thank you so much, Abby! You, my friend, are SO amazing! I LOVE this idea! 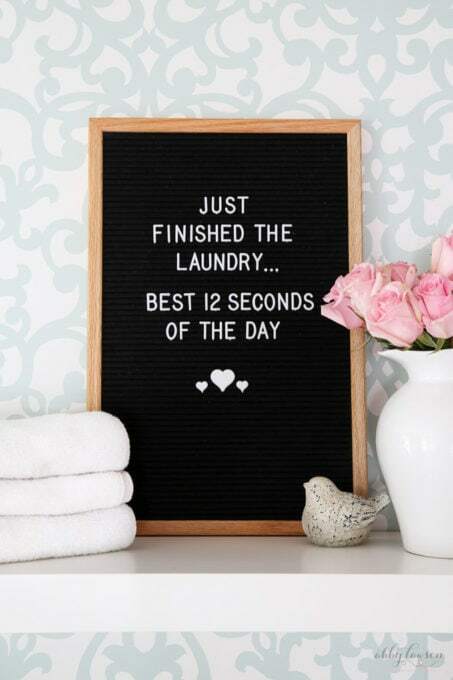 I have these in my laundry room (like, store-bought signs), and have always wanted to do a printable of them but never really figured out how. Now I don’t have to! Thank you so much for being part of this hop! YESSS I totally needed one of those guides to know what the instructions say! I’m totally printing and putting on the display table in our laundry nook! Thank you! When I was in college I had to take a textiles class for my degree and one of the test was literally everything on this printable! LOL If only I’d had it back then… #cheatsheet So cute, though! This is such a great idea, Abby! I love these printables! I used to have something similar at my old house and they were so practical and pretty! FYI, for berry stains, like blackberry and raspberry, lemon is amazing as well. First rinse spot with cold water, drip lemon juice on, leave for a while, then wash like normal! We were blackberry picking and my son got blackberry stains all over his orange shorts. I figured I would never get it out, but the lemon worked a treat! I need to print out that stain removal sheet. Going to the dollar store to pick up a white frame. It’s just adorable and more than useful. Loe it! For those of us without dragon scales, this is awesome! Thanks — printed it and hung it by the washer! Per the Red Wine Industry, if possible, soak a red wine stain with WHITE wine and the red wine should come out of the fabric almost immediately. I’ve had red wine spilled on a brand new chair and by “dousing” the seat cushion in white wine, the red wine stain came out immediately. I’ve also had red wine splashed on a good suit and by soaking the stain immediately (I was still wearing the suit), the red wine was rinsed right out. This is the reason why I NEVER have red wine in my home. I always serve white wine. To remove a ball point pen stain from fabric, make sure that the hair spray used is the CHEAPEST hairspray you can find. The cheaper the hairspray, the move lacquer the spray contains and this is the ingredient that dissolves the ink.